We’re so excited to share our love of flowers and the magic happening at the flower farm with you! This is the perfect opportunity to spend a few magical hours amongst the flowers. Join us to learn about our flower farming operation and we will help you design a floral arrangement using gorgeous flowers grown right here on our farm. Come and meet new flower-lovers or bring a friend - you are sure to have a lovely time either way. 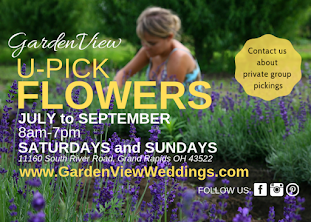 We are not usually open to the public, so this is your chance to get behind the scenes and experience the beauty of the GardenView flower farm. We’ll begin our time together with a tour of the flower fields. As you stroll amongst the beauty, you’ll learn about our growing techniques and hopefully become inspired to grow your own patch of blooms. 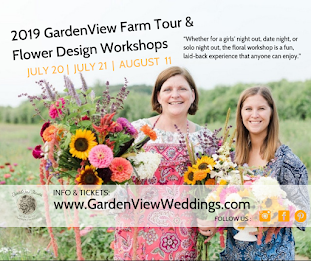 After the tour of the fields, head designer and owner of GardenView Weddings - Jenny VanHoutte - will demonstrate how to arrange a centerpiece while talking you through her basic design philosophy and principles. Then, it’s your turn to create your own! 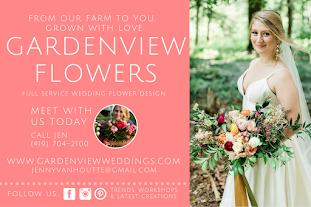 You will receive one-on-one support and guidance throughout the entire process from Jenny and her floral team with a huge assortment of flowers to choose from! Our goal is for you to express your creativity using flowers. No prior experience necessary! We’ll enjoy ice cold beverages and snacks from some of our local small business favorites. What’s not included are aprons, sun hats, gloves and wellies which are highly recommended and fun. All purchases are final. In case of severe weather the workshop may be rescheduled. Attendees will be notified in advance as much as possible. While we anticipate each date selling out we must have a minimum of 10 attendees per date to run the event. Upon purchase of farm tour ticket, you will receive a confirmation email for your purchase and we will also send you a Workshop Gift Voucher if you are gifting this to someone else.